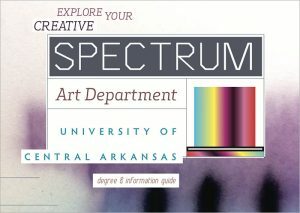 The Department of Art offers two degrees. Click on the image (or here) to download an exciting visual overview of student work in context with degree information. Degree programs follow a structured curriculum from admission to graduation and include a foreign language requirement. All art students experience the visual arts from diverse cultures and historical periods in an academic setting. All BFA majors, BA with emphasis in fine arts majors, and BA with emphasis in art education majors are screened through a portfolio review process, the Sophomore Major Advancement Interview (SMAI). The SMAI committee looks for evidence that the student possesses artistic sensibilities and a strong commitment to higher education. Advancement to an art degree program is contingent upon the recommendation of the art faculty after the SMAI. These students are also required to participate in a senior exhibit during their final year of study. A minor is not required. This degree may require more than the normal eight semesters to complete. Students intending to apply for the BFA in Studio Art degree are strongly encouraged to enter the pre-BFA Studio Art track. Pre-BFA Studio Art students are required to attend a BFA orientation meeting in the fall or spring semester. No emphasis is declared in the pre-BFA track. Upon successful completion of the Sophomore Major Advancement Interview (SMAI), students with a 2.5 cumulative GPA and a 3.25 major GPA on a minimum of 24 hours of art may apply for entrance to the program. Transfer students, students changing majors, or students changing degree programs may not be required to start the program in the pre-BFA track, but must meet the requirements outlined in the previous paragraph. The Department offers a Minor in Art and a Minor in Art History. Both programs require students to complete 24 hours of art. Click on link in text or to the left for more information. Art faculty may invite students into the departmental honors program who have completed at least 72 hours (24 of which are in art) and have a major grade point average of at least 3.4 and a cumulative grade point average of at least 3.25. After the invitation, students wishing to participate select a faculty advisor and develop a proposal which must be submitted to and accepted by the Departmental Honors Committee in the semester prior to enrolling in ART 4390 Special Studies. Students work with their faculty advisor on the proposed research or creative work and submit the completed work to the Departmental Honors Committee for review. Students present final work to the Honors Committee and the faculty advisor for the final evaluation. Honors standing is granted only to those students receiving a frade of “A” in ART 4390. Credit will be granted for students who receive a grade of “B” or “C”. Students earning honors standing are so noted in the university’s commencement proceedings and the designation of “Undergraduate Scholar” is printed on both their transcript and their diploma upon graduation.